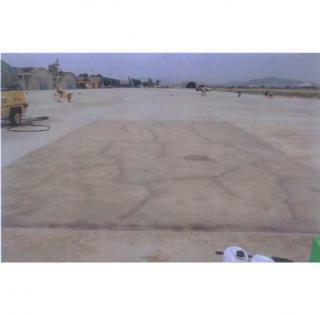 Radcon has been applied to the "Hangar North" area at Grosseto Airport where it was used as a testing ground to to solve the problem of concrete surface deterioration. Even though the speed of the aircraft in this area is limited and rarely exceeds 30kms per hour, the types of the aircraft varies from the Airbus A-300, the Gulfstream, the Falcon 900 and the F104 weighing from 10,000kg to 140,000kgs. Radcon was not only tested to protect the concrete but also to display its durability, resistance to abrasion from the elements, fuel, grease and hydrocarbons.